Abigail, another of our Arizona natives was born and raised in Chandler, Arizona. She fills her personal time with catching up on her reality TV shows, indulging in her inner foodie, attending hot yoga classes, traveling, and spending time with her friends and family. 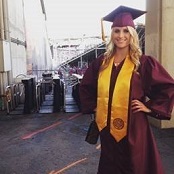 She is an Arizona State University graduate in Special Events Management and is starting her career with KCA assisting with several trade and professional association’s administration and events.